The Defending Champion of UK Championship John Higgins and Ding Junhui survived their first round thrillers on the flukes in key moments. John Higgins had a hard time given by his first round opponent Rory McLeod. Higgins won the opening frame with 80 but McLeod led 2-1 before Higgins won the respotted black to level 2-2. McLeod shocked the defending champion with 3 half centuries to lead 4-2. The Wizard from Wishaw found his form to go 5-4 but McLeod forced a decider. The first chance in the decider went to Higgins, he made 52 before missing the match ball to the middle pocket. McLeod went for the red and missed, but left his opponent in a snooker. 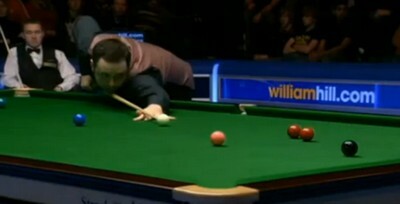 Higgins hit the red and saw it travel the length of the table and drop into a baulk corner. For good measure, he fluked the yellow as well to seal victory. Higgins admitted he was lucky to get the flukes and revealed that he is suffering from back problem. "I've been driving up and down the motorway over the past week, to do a promotional day here and to the PTC event in Sheffield, so that's not great for the back. "It would have been a bad end to the year to lose today so I'm delighted to win and I feel ok about my game." 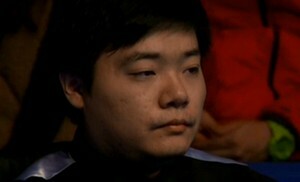 Ding Junhui, the winner of the tournament in 2005 and 2009 recovered from 0-2 and 4-5 down to beat Mark Davis 6-5. Mark Davis had a chance to clear up but ran out of position for the final black. Eventually Ding potted the final black to force a decider. In the decider, Ding missed the frame ball and the break ended at 61 but left Davis a great chance. Davis replied with 49 and left blue, pink and black on the table. The China Dragon fluked the final pink to secure his thrilling win. Opponent of next round for Ding will be Matthew Stevens. Stevens defeated Marcus Campbell by 6-2, whose friend and room-mate travelled to tournaments with him throughout his career, died suddenly this afternoon after suffering a heart attack. Stevens played well tonight as he made two centuries 136 and 140 to rewrite the highest break of the tournament so far. Stephen Maguire beaten his fellow countryman Stephen Hendry by 6-3. The Champion here in 2004 began the match with 122 and go 3-1 ahead of Hendry. However, Hendry pulled two back to level 3-3. It did not stop on-fire Maguire, knocking 134, 90 and 52 to win the next three frames to end the match. Maguire will face Higgins for the next round. Neil Robertson and Graeme Dott are set to clash in the second round after their 6-1 victories over Tom Ford and Matthew Selt respectively today. Dott had a run of 117, 75, 63 and 54 to put him 4-0 up on Selt before Selt pulled one back. Then Dott made 99 and 45 to cruise his victory. Robertson said "It was hard to judge my own performance because I didn't have to do that much. Hopefully when I play Graeme this time I won't keep you until 1am!" Their meeting will be a repeat of Crucible Final in 2010 as Robertson won 18-13.